BASEL CITY, Switzerland - July 11, 2018 - PRLog -- Yerra Solutions AG, a global provider of innovative solutions for in-house legal & IP, eDiscovery & Investigations and compliance, today announced the availability of expanded processing and hosting services for eDiscovery projects and investigations. Yerra's global data protection, forensic and review expertise combined with industry leading technology and in-country servers in Switzerland makes Yerra an excellent choice for handling projects of any size and complexity. The offering features the AccessData eDiscovery platform, AD eDiscovery, which was chosen for its superior forensic investigative features and ability to seamlessly transfer investigation projects into the document review phase. AD eDiscovery is a fully integrated platform for conducting enterprise-wide search, targeted collection, preservation, litigation hold, processing, data assessment and complete legal review – all while keeping costs in line and reducing risk. The software features a widget-based dashboard that provides users with a single, comprehensive view into the status of key functions. It serves as a powerful tool for Yerra experts in serving the complex needs of the company's clients. "AD eDiscovery provides the features that our experts need to handle complex, international projects," states Will Wilkinson, managing director of eDiscovery Solutions at Yerra Solutions. "Their technology will help enable us to continue rapidly extending our core eDiscovery and Investigations solutions into Hong Kong and Singapore, supporting our clients' local offices with globally consistent services." 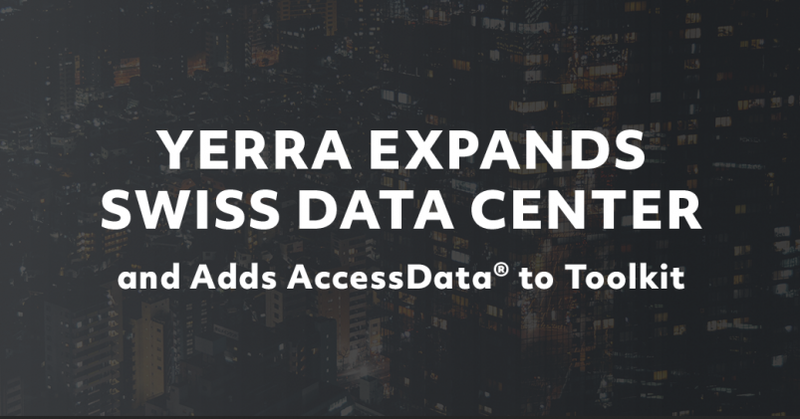 "Yerra Solutions is a truly global provider of eDiscovery services, which gives them a unique understanding of rapidly evolving cross-border issues and data protection regulations," said Abdeslam Afras, executive vice president of international business at AccessData. "In particular, the physical location in Switzerland of the Yerra data center, which supports their hosted solutions offering for eDiscovery services, affords law firms and their corporate clients with important protections under the strict Swiss data privacy laws. We are delighted they have chosen AccessData's technology to underpin their eDiscovery and Investigations solutions, making our AD eDiscovery application available to their clients." To learn more about Yerra's services and to request information click here. Whether it's for investigation, litigation or compliance, AccessData® offers industry-leading solutions that put the power of forensics in your hands. For 30 years, AccessData has worked with more than 130,000 customers in law enforcement, government agencies, corporations and law firms around the world, providing both stand-alone and enterprise-class solutions that can synergistically work together. The company is backed by Sorenson Capital, a leading private equity firm focused on high-growth portfolios. For more information on AccessData, please go to www.accessdata.com.